The film school was definitely a great opportunity for me because we had no theoretical exams. Our papers were actual films and we could, therefore, experiment on each film we made after every seminar or workshop. Some cinemas in Berlin provided us with free tickets and it was possible for us to watch as many different films as we had time for. I could choose my own subjects, my own format, and the people I would work with. In a way, it was a freeing experience. Back in Kenya, though having to adjust to a very different environment with fewer technical and professional structures, in the long run she finds it to be much more pleasant and open and the people friendlier and easier to get along with. Above all, she is contributing to the development of a Kenyan film culture. I like films which connect more to us today or at least depict how things have changed and why... films which embrace the whole character of Africans...films which can make us laugh, which appeal to our emotions and which show us who we are...African Cinema should also produce films which not only portray life as it is, but have characters whose world is accessible to us today. Villages are nice romantic places, but there are cities in Africa too. There are the high and mighty who can be subjects of satirical critique. There are career women and brilliant children. There are normal issues of life. Wanjiru sees in Riverwood the potential to make Kenyan experiences accessible to Kenyan audiences. Moreover, her work as a film instructor also contributes to the film culture of Kenya. She finds teaching at Kenyatta University to be both a challenge and a blessing. It is a challenge because there are limited resources: lack of films to teach, technical books, a film library. In addition, there is the widely-held view that filmmakers are technicians rather than artists. The blessing is the pleasure of working with students, to work towards the demystification of film. Several of her students participated as volunteers at the Kenya International Film Festival and the Future Filmmakers Workshop which she also participated as co-ordinator. Strong images would give her more confidence to stop believing that she needs to be like this or like that, depending on societal beliefs and notions. I like her image when she is shown to be of an independent mind, when she is not a passive being who is too busy following false tracks laid down for her by others who are more interested in "keeping her in her place." One should give her the opportunity to define where her place is! And cinema, because it allows us to travel in a projected world of the possible, not necessarily the present reality, is a great opportunity! 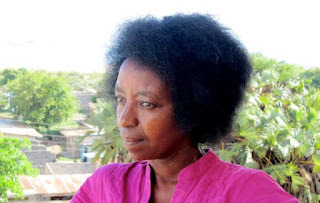 *Quotes from interview with Wanjiru Kinyanjui by Beti Ellerson (Sisters of the Screen: Women of Africa on Film Video and Television).